Time and again I chuckle about the similarities. This business of raising children is not too dissimilar to that of being a recovering alcoholic. Yesterday morning I allowed myself to be overwhelmed with the changes that are happening too rapidly for my tastes. But later in the afternoon I pulled it together and reminded myself that I needed to live today, “one day at a time.” And furthermore, I needed to accept the things I cannot change. With the Serenity Prayer going around and around in my head I set off to the store. If my tiny little baby insisted upon crawling it was time for a gate at the bottom of the stairs. My compulsion to keep all things kid and baby out of the adult living spaces at night is challenged by the baby gate’s addition. However I think I succeeded in making it not stick out like a sore thumb. With the addition of a square baluster I stained to match my hand railing and a round piece of wood I painted to match my trim I was able to get around the uneven surface issues presented by my trim molding and my handrail. 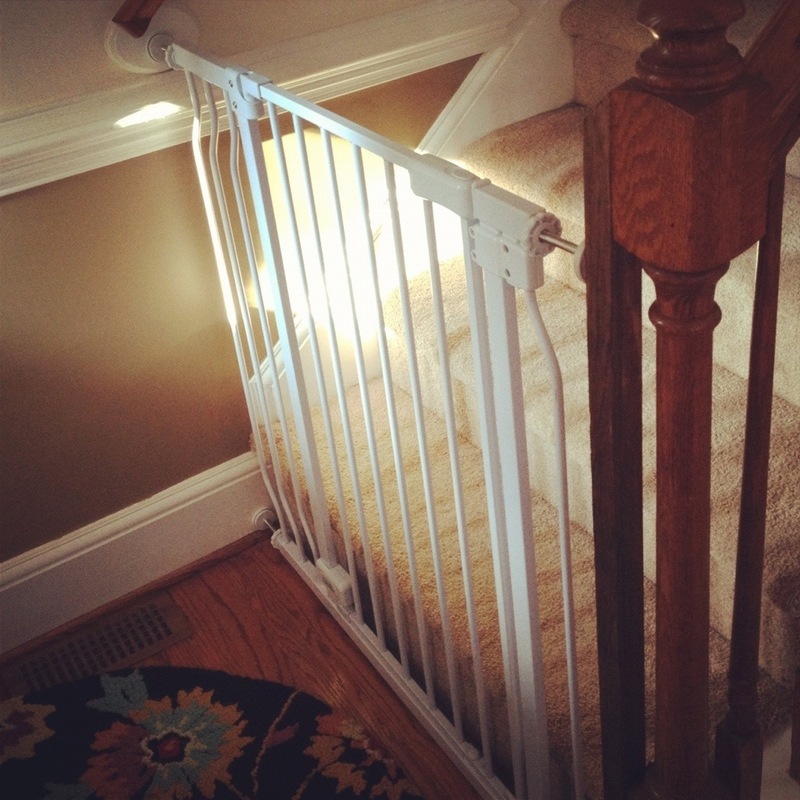 I am available via email for How To Make My Baby Gate Less Ugly consulting services. I can be reached at IHaveTooMuchFreeTime@stayathomemom.com. It’s hard to swallow. This tiny little baby is almost seven months old and army crawling all over the place. She will be standing at the gate hollering for her sister in a matter of moments. But today, today is she is still my baby. Because today I woke to a nursling in footie pajamas. Years from now you will be able to spot her in a group picture from middle school. “Which one is Lucy?” someone will ask. “She is the one in the footie pajamas” another mom will answer. And she will lower her voice to a whisper and mouth “Last baby, the poor mother, she has issues…” You think I am kidding? This entry was posted in Parenting and tagged baby, babyproofing, Breastfeeding, Lucy, mothering, SAHM, stay at home mom. Bookmark the permalink. SEVEN months? Didn’t you just post your birth story or something? Tell her to stop being so darn cute. Hahaha, when did you lose the piggies I loved so much? 36? Lucy is doomed. Do they make wedding gowns with footies? that picture just made my womb convulse. damn you and your precious, precious nursing baby in footy pjs. Ha! This cracked me UP. We have FIVE baby gates in the house (and I wish we had one more). I could definitely use your services. My youngest is in footies today and he’ll stay that way. Is there anything cuter? ?